Changing land-use has altered the biogeochemical signatures and flow patterns of many rivers. Development within river watersheds impacts processes in both the river and the coastal zone (Howarth et al. 1996; Verity 2002a). Loading of nutrients, organic matter and pollutants from rivers can cause and/or exacerbate eutrophication, harmful algal blooms and fish kills, reduce water quality, disrupt the heterotrophic/autotrophic balance and/or drive system-scale changes in estuarine production and trophic structure (Nixon 1995; Vitousek et al. 1997; Paerl et al. 1998; Verity 2002a, 2002b). Nitrogen loading to estuaries is of particular concern, as coastal waters are often nitrogen limited and increased nitrogen delivery can fuel excess production and lead to eutrophication (Nixon et al. 1996; Verity 2002b). Land use has also altered the delivery of sediments to coastal ecosystems. Sediments provide a key source of material for marsh vertical and horizontal accretion. As sea-levels rise, marshes must accrete to keep pace or risk permanent inundation. Average concentrations of suspended sediment in rivers draining to the East and Gulf Coasts follows a regional pattern, with higher concentrations in the Mid-Atlantic and Western (LA and TX) Gulf, and lower concentrations in the Northeast and Southeast (Fig. 1). Interestingly, these patterns are quite similar to the pattern of relative sea level rise (RSLR) along the East and Gulf Coasts (Fig. 1). Over the past approximately 30 years, the concentration of suspended sediment in many of these rivers has changed (Fig. 1). Declines in sediment can be linked to increased population density and dam construction (Fig. 1). Our research has shown that sediment concentrations in rivers draining to the Mid-Atlantic and Western Gulf Coast have experienced the largest declines in suspended sediment (Fig. 1). Therefore, tidal wetlands that are experiencing the fastest rates of RSLR are also experiencing declines in sediment delivery. Our ongoing work examines the links between land use in the watershed and the impacts in the coastal zone. 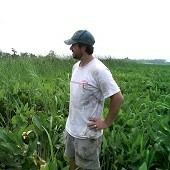 We are especially interested in how changing sediment delivery may impact rates of marsh accretion. Figure 1. 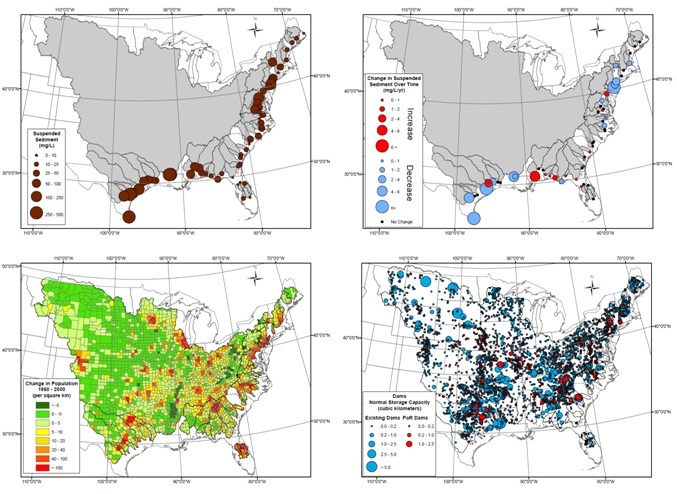 (top left) Average concentrations of suspended sediment in 61 rivers draining to the East and Gulf Coasts of the United States using data from the United States Geological Survey, (top right) change in suspended sediment concentration over time, (bottom left) change in population density in the watersheds draining to these rivers, and (bottom right) the total storage capacity of dammed reservoirs and the increase in storage capacity of dammed reservoirs for the suspended sediment period of record.